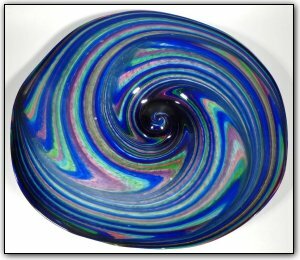 This striking wallbowl features shades of blues, purples, aqua, greens, pinks, as well as many colors in between. It was made with hand pulled canes which is a two-stage time consuming process. First Dirwood hand pulled the canes used to make this wallbowl, then he made the wallbowl using those canes.